Hon. Castro on “hot seat” in court! BELIZE CITY, Thurs. May 14, 2015–Belize Rural North area representative and Minister of State Hon. 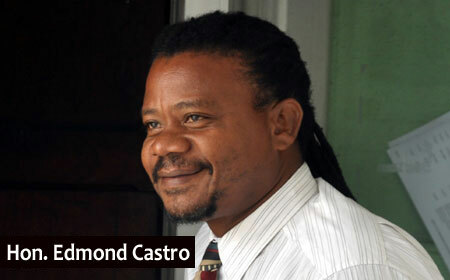 Edmond “Clear the Land” Castro took the witness stand in the Supreme Court of Justice Courtenay Abel today, as the defamation claim he filed against Alvarine Burgess, an immigration agent and the so-called “whistle blower” who is named as the first defendant, and Great Belize Production (Channel 5 News), the second defendant, which aired Burgess’ allegations against him, came to trial. 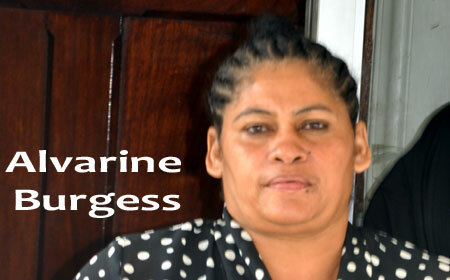 In October and November, 2013, when the Elvin Penner passport scandal was making national news, Burgess took to the airwaves of Channel 5, and in two separate interviews, alleged that she paid Castro thousands of dollars to secure his recommendation for visas to Asians who wanted to visit Belize. After Channel 5 aired Burgess’ version of the Castro visa recommendation story, Castro demanded an apology and retraction. Burgess and Channel 5, however, ignored his demand. Castro decided to file the defamation lawsuit, claiming that he suffered damage to his reputation. Castro’s attorney, Rodwell Williams, S.C., told the court this morning that the defendants cannot prove that his client was involved in any visa hustle and that his reputation had suffered damage as a consequence of the defendants’ assertions. Castro spent the entire morning and afternoon of the hearing on the witness stand, and was subject to blistering cross-examination from Channel 5’s attorney, Godfrey Smith, S.C., and Burgess’ attorney, Anthony Sylvestre. Smith was relentless in questioning Castro about the code of ethics elected politicians must follow so as not to demean their office and make allowance for their credibility to be called into question. “Did it ever cross your mind that something was wrong with you signing letters of recommendation for people you never met?” Smith asked Castro. Castro replied that there was no requirement that he know the persons whom he was recommending for the visas. Castro said that he would never do that again, in response to a question as to whether he would put his signature again to recommend people he doesn’t know. In response to another of Smith’s questions, Castro said it never crossed his mind that the individuals that he was recommending could be involved in terrorism. “Does it occur to you now that something was wrong in lending your signature to facilitate a visa hustle?” he was further asked. “Is it not true that you asked Ms. Burgess how much money she was getting from her business associate?” asked Smith. “There was no discussion of that,” Castro answered. “I am putting it to you that you knew the risk you were taking by putting your signature on those letters,” Smith said. “That answer would be no,” Castro replied. “I am further putting it to you that you demanded and in fact got payment from Ms. Burgess for those letters,” Smith asked. “I am putting it to you that you participated in that visa hustle,” Smith said. “Does it occur to you now that something was wrong in lending your signature to facilitate that visa hustle,” Smith asked. “Did you ever ask her how it is that this letter will give her money to take her husband abroad?” Smith asked. “I did not, in my own mind, wonder how the letter would give her money to take her husband abroad,” Castro replied. “Can you see now that you were risking your reputation?” Smith asked. “When the Prime Minister said that he heard that ministers were hustling visas and it could bring down the government, might he have been referring to the hustle you were involved in?” Smith asked. “I can’t answer that,” Castro replied. Smith then turned his line of cross-examination to the fact that Castro was out of the country when the Burgess story was aired. “When you returned to Belize, you avoided the media at the Philip Goldson International Airport?” Smith asked. “No media asked me any question,” Castro answered. “Did you leave the airport through a back entrance or a side entrance?” Smith asked. Smith turned his line of questioning to the allegation that was made against Castro by a Belizean-American woman who reported that he had taken money from her for a piece of land that she never got. Castro said that the woman lied about him. Smith then asked him if it was not true that the Prime Minister had demoted him as a result of that incident. Castro remained silent on that question. In the afternoon session, Sylvestre questioned Castro about 21 visa recommendations that he had signed. The thrust of Sylvestre’s cross-examination pointed to the fact that Castro had to admit that he did not have a system of checks and balances in place for the visa recommendation letters that he had been signing. Under further cross-examination by Sylvestre, Castro admitted that he could not recall the exact date when he began signing visa recommendations. “And in fact the only thing he did not agree on was the acceptance of money that was put to him for the visa hustle, but virtually, he agreed to most other things,” Smith explained. “The thrust of the cross-examination was directed to establishing that after he thought about it, he realized that his actions, that of his office, what he was lending his office to, could amount to a visa hustle, he accepted that,” Smith pointed out. “He accepted that he had done visa recommendations for Asian nationals, on more than one occasion for people he had no knowledge who they were and why they wanted to come to Belize, and what they wanted the visas for,” Smith went on to state. Castro’s attorney, Williams, told reporters that the other witnesses that they plan to call would be brief and would not take as much time as today’s witness, who is the claimant. “What was sought to be done today was to put in question the witness’ credibility. Let me say this, if I can say anything further, everyone of God’s children do have a reputation, the good one, the bad one, the pretty one. They do have a reputation that is capable of being harmed or injured,” Williams said. Williams said he does not think that Castro’s reputation was damaged today. “His case remains the same,” Williams said. Castro will be re-examined by his attorney tomorrow, and after that, other witnesses will be called before the case proceeds to the legal submissions and points of law.